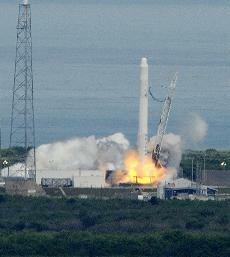 The Space X Falcon 9 rocket lifts off from Pad 40 at Cape Canaveral on June 4, 2010 in Florida, on its first test flight. The Federal Aviation Administration today issued SpaceX the first-ever license for a commercially developed spacecraft to re-enter Earth’s atmosphere from orbit. The license was needed for the company to complete its first operational flight of the Dragon spacecraft during a NASA demonstration mission targeted to launch Dec. 7. This entry was posted on Tuesday, November 23rd, 2010 at 1:55 pm and is filed under Aviation News, FAA & Government. You can follow any responses to this entry through the RSS 2.0 feed. Both comments and pings are currently closed.